Thanks for the response. Yours was one of the websites that I was cross referencing to find out about this one. Both coins I received came with the cert to say Diamond finish, 30,000 blah blah and as far as I am concerned the certs are genuine. The seller has a very successful shop on Ebay and I've bought from him before and been very happy. It's just this piqued my curiosity when I was entering them to my list in Numista. I know there's big money in Isle of Man Christmas coins, is there a chance they are fake? It hardly seems likely, especially seeing as everything else looks perfect including the unusual PMM mark, so why would something obvious like this get omitted? Or is it more likely they were struck with a different, unidentified die. 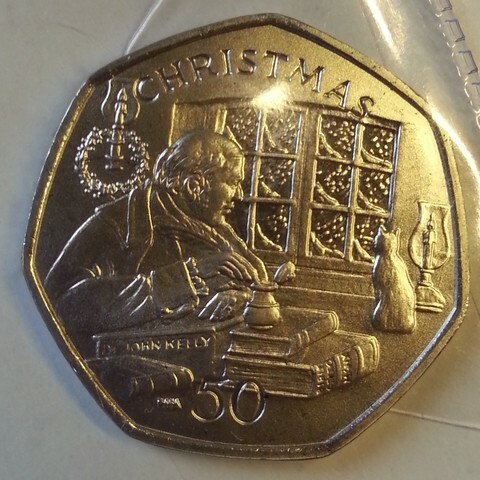 My Isle of Man 50p 2000 Christmas coin is PMM BB. My piece was purchased around the time of release and loose and as expected it was purchased without a "certificate". Your piece will for sure be real and could be worth two pounds or a touch more. why nobody gets attention on 1980 mule coin? either die letters or mint marks, they are extremely debatable due to lack of more open source. For PMM in 2000, this is great info, and thank you for the people sharing this with us. here is a suspect 'BB' from 2000. "diamond finish" are issued in packs to best of my knowledge, usually the self contained Christmas cards - this just doesn't look good enough - and I don't think there are versions with AA, AB etc. 2000 one, it has many versions. the one in the pic i would personally say it is circulating type. It is very interesting to see more different coins here. In this year, there is no any AA coins struck. Is there any information on these batch marks in general? Or do they only appear on Isle of Man coins? They used to appear on Gibraltar coins as well. both IoM & Gibraltar coinages found die letters, priority to 2004, cause coinages of gibraltar were struck by the Pobjoy mint. there is no longer quite so much on it about these dieletters. These reportedly appear on the coins of the Millennium of Tynwald set of five crowns, these are as KM-46, 47, 48, 49 and 50. I have a set of the normal strike Copper-Nickel pieces (KM-46, 47, 48, 49 and 50) and only the KM-47 piece has dieletters, the dieletter pair is "CB". The Silver Proof set of these I have seen (these are KM-46a, 47a, 48a, 49a and 50a) and all of these were without dieletters. No other crowns are known with dieletters. So my KM-47 must be "CB" - per my writing. Looking on google/ebay I could see a few pieces of KM-47 without dieletters and a few with them. Only on one piece were the dieletters easy to see. Here - https://www.ebay.co.uk/itm/251357941800 (use the magnified view) - and this would seem to be "CE". I saw no sign of dieletters on pieces seen in images of the pieces in the rest of this 1979 set. I have seen the CA as well.